That's the title of an article in Psychology Today that we recently discovered. Zentangle® is known to many artists and craftivistas as a way to create structured designs through drawing various patterns. Sometimes mistakenly called “Zendoodling” or “tangle doodling,” Zentangling or tangling is actually a formalized process that defines itself as something other than mere doodling because of its theory and approach. 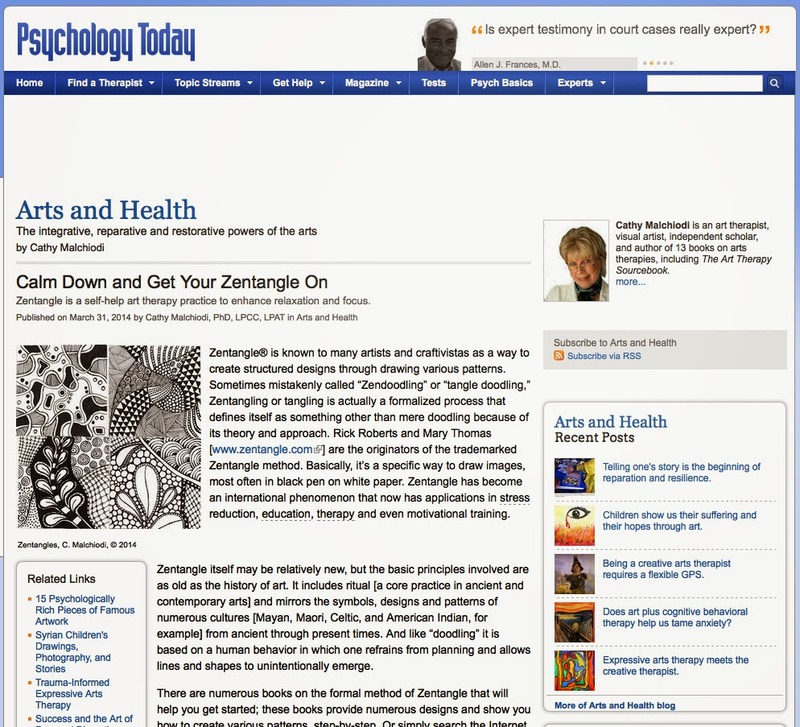 Rick Roberts and Maria Thomas [www.zentangle.com] are the originators of the trademarked Zentangle method. It Teaches How to Own Mistakes. In the complete article, she expands on those four benefits. Her last reference to "aimlessness" reminded me of Leisure, The Basis of Culture, a book by Josef Pieper. Mr. Pieper's book builds on her insight into the value of "aimlessness" and has many other ideas that resonate with practicing the Zentangle Method. We invite you to visit her blog post to read the complete article and perhaps, to leave a comment. Thank you, Dr. Machiodi, for taking your time to write that article. Dear Maria and Rick, What a wonderful article! I'm so glad the word is getting out. I discovered Zentangle a month ago and haven't stopped since. I'm a colored pencil artist (www.domistauberart.com) and a musician, and Zentangle has turned out to be the perfect additional creative outlet for me. I tend towards perfectionism, but when I'm tangling I'm able to let go of plans and goals and sink into the moment. I fear boredom and love complexity, and tangling enables me to focus on each tiny stroke and still come out with an amazingly intricate little piece of art. I've been making Zias as Christmas gifts, and I can really feel what is unique about your system. Trying to make a piece turn out a certain way is fun, but when the gifts are done I'm heading straight back to the original Zentangle approach. Thank you so much for inventing it!! Thank you for sending the article. I found it very good and even posted a comment. Not too happy with the nay sayers! I am posting it on my blog for readers to see. Amsterdam - Day 2 of . . . .